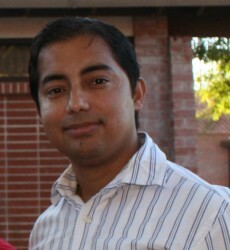 Bhuwan Thapa is a PhD student of Geography in the School of Geography and Development at University of Arizona. His research interest focuses on policy analysis of climate change, integrated assessment of river basins, the water-energy nexus, and synergy and trade-off between mitigation, adaptation and sustainable development. Prior to joining the PhD program at the University of Arizona, he had five years of research and work experiences in Nepal and USA. He was a consultant for the Japan Water Agency and Danish Hydraulic Institute for two years in an Asian Development Bank project on the Bagmati River basin, Nepal. He has worked in the areas of water and sanitation, community forestry, environmental impact assessment, environmental laboratory analysis and climate change assessment for national and international organisations such as the World Wildlife Fund (Nepal), WaterAid in Nepal, the Center for Clean Air Policy (USA) and A4 Scientific (USA). He received his Master’s degree in Public Policy from University of Maryland, College Park, USA where he was involved in multiple research projects on energy and land conversion modelling, econometric analysis and sectoral study of climate change mitigation actions. He received his Bachelor of Environmental Science from McNeese State University, USA and Bachelor of Environmental Science from St. Xavier’s College, Nepal.